TSV's 2018 Lunar New Year compliance activity was bolstered by eight officers from the Victoria Police Heavy Vehicle Unit. 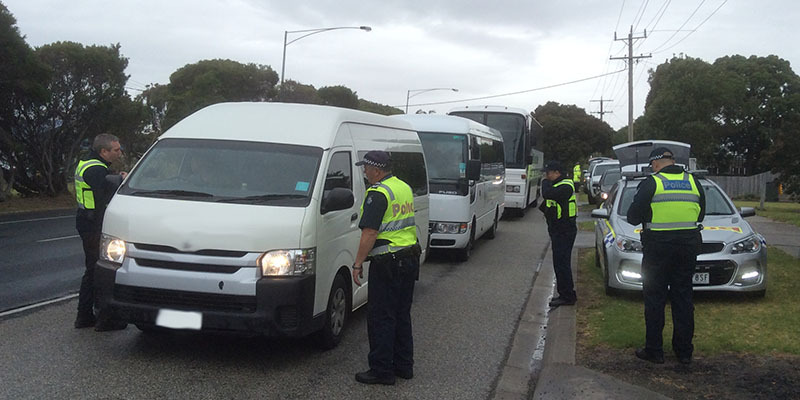 During two-day activities at both Phillip Island and the Twelve Apostles, we checked 350 buses and their drivers. We issued 79 infringement notices for various offences, such as work diary issues, failing to carry driver’s accreditation certificate, unlicensed driving and driving unroadworthy vehicle. We issued 44 defect notices for problems such as worn tyres, faulty seat belts, cracked windscreens, and suspension issues. We carried out 150 preliminary breath tests and 55 drug tests, with no positive results. It is disappointing that drivers continue to fail to maintain their driver work diaries in accordance with the Heavy Vehicle National Law. One driver was issued with an infringement notice for the same issue with his work diary on two consecutive days. TSV is also concerned that a worn tyre on one operator’s bus was not detected during the pre-trip inspection. This operator was prohibited from using the bus until the tyre was changed. Following a frantic search by the operator for a tyre fitter, one was eventually located in Colac. After a significant expense to the operator and a two-hour delay for the passengers, their tour eventually continued with a replacement tyre. TSV auditors will be following up these deficiencies with relevant operators, ensuring they implement effective remedial action to prevent recurrences. TSV has further multi agency compliance activities planned and expects the industry to take its safety obligations seriously to avoid further enforcement action.